“Indie” mode is on again for Gus Van Sant, the director of “Elephant”, “Paranoid Park” and 2008’s Oscar Nominated “Milk”. 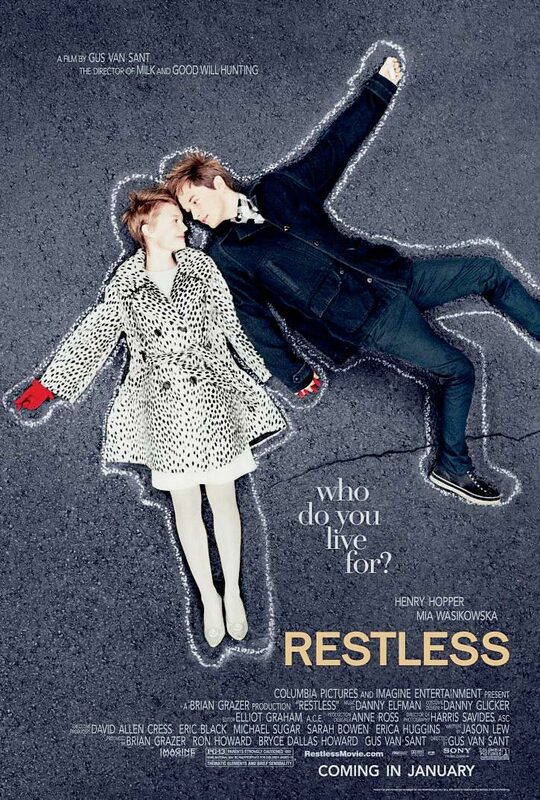 I don’t know what Van Sant’s purist will make of “Restless”, but as far as I’m concerned, I thought it was really impressive. The movie takes place in Portland, over three months as Enoch (Henry Hopper, Dennis Hopper’s son), an orphaned high school dropout who attends random funerals for kicks, meets and falls in love with Annabel (Mia Wasikowska), who’s dying of cancer. That should instantly turn some viewers off. But in case you’re as patient and curious as I am, you’ll stick around and watch the story unfold into a series of sweet and tender moments. Did I mention Enoch’s parents died in a car crash? And check out Hiroshi (Ryo Kase), Enoch’s best friend before Annabel. He’s the ghost of a kamikaze pilot from WWII. Too damn depressing, I know- a kind of “Harold and Maude” for the 21st century with both lovers being death-obsessed. But before you stop reading this review and decide to skip this movie no matter what, let me remind you that the director is Gus Van Sant. The man knows about young love more than any other director out there (check out “Paranoid Park” and “My Own Private Idaho”). It’s a challenge, actually, making a film that deals with such a serious subject and yet expresses something authentic and personal, and not every piece in “Restless” pays off. But the film is beautifully photographed and it’s fueled by some truly strong performances. Wasikowska, from “The Kids Are All Right” to “Jane Eyre”, is emerging as a wonderful actress. And Hopper has his father’s genes and a sense of humor all his own. He’s truly unforgettable. A star is born. Might be a bit depressing in case you’re looking for something light, but both actors are truly wonderful.